Located south of San Francisco's border, San Mateo County occupies much of the San Francisco Peninsula. It sits between both the Pacific Ocean and the San Francisco Bay bordered to the south by Santa Clara and Santa Cruz counties. San Mateo County encompasses 744 square miles of coastal and mountainous terrain giving it characterized by scenic vistas and diverse natural surroundings. This county is known for its highly desirable residential suburbs, major metropolitan centers, and large number of tech industry companies located in and around the county. San Mateo County features a great mix of amenities, a wonderful selection of homes, and vibrant downtown areas. Its neighborhoods are only minutes away from Google, Facebook, and other major Silicon Valley employers and company campuses. In August 2016, San Mateo County boasted the lowest unemployment rate in the Bay Area according to California's Employment Development Department. Plus, it's almost always sunny, with mild year-round weather, even in the winter. Overall it's a place that offers a great environment and a comfortable North California lifestyle with many career opportunities in the tech industry. Which explains why it's such a popular choice among young professionals. Centrally located between San Francisco and the rest of Silicon Valley, San Mateo County is one of the most desired residential suburbs for young professionals in the Bay Area. This location features a lot of great neighborhoods and recent constructions. With many new developments set to transform the area under way. Single-family homes are the most abundant housing option followed by condos, townhouses, and vacant lots and land. Hillsborough – One of the most affluent neighborhoods in America. Home to magnificent luxury homes and some of the top ranked public elementary and middle schools in the area. Foster City – This master-planned community lies on the east side of the county and serves as the area's gateway to other major metros in the East Bay Area. Foster City ranks high on livability rating and also has great schools. Burlingame – Charming neighborhoods, top schools, unique architecture, high livability, proximity to great shops and restaurants – Burlingame offers you all these and more. Millbrae City– Located south of San Bruno, Millbrae is one of the most charming suburban cities in San Mateo County. A great community for families, it featuring serene tree-lined streets and close proximity to top-ranking schools. Redwood City – The county seat of San Mateo County located in the heart of Silicon Valley. It features a vibrant downtown area filled with restaurants, shopping, and entertainment that attracts residents from all over the peninsula. San Mateo City – Located half-way between Downtown San Francisco and Downtown San Jose, this thriving metropolitan tech enclave sits at the heart of Silicon Valley. Residents enjoy close proximity to great schools, restaurants, shopping, entertainment, and high-profile employers. Contact Richard Sarro today to learn more about San Mateo County's homes and neighborhoods. Discover a world of fun and excitement when you choose to live in San Mateo County. Here's a short list of great attractions waiting for you here. 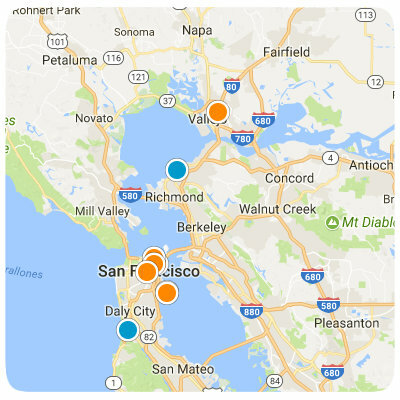 Best foodie cities in San Mateo County include Menlo Park, San Mateo, Foster City, Pacifica, Redwood City, and more. Explore the single-family homes, condos, townhouse, vacant lots and land in San Mateo County. Contact San Francisco and Bay Area Realtor Richard Sarro today.